The new 2016 Silverado 1500 builds on Chevy Trucks’ legacy of dependability with a dramatic new design, advanced connectivity and enhanced customer-focused technologies. New front-end designs with a bolder, more sculpted appearance reflect the underlying strength of the Silverado’s high-strength steel construction, which helps provide the capability customers need and the value of low-cost ownership they count on. Powerful, efficient V-8 engines are an integral part of the Silverado’s capability and use advanced technologies such as direct injection, Active Fuel Management (cylinder deactivation) and continuously variable valve timing to offer the best V-8 fuel economy ever in a pickup – 23 mpg in 5.3L models – and the most powerful V-8 in a light-duty truck: 420 horsepower (313 kW) from the available 6.2L engine. The 6.2L V-8 enables up to a 12,000-pound max trailering rating, when properly equipped, providing the strength to haul heavy loads for work or recreation – with the confidence that comes from the experience of more than 100 million Small Block engines built since 1955. • Power-articulating assist steps are available on Silverado High Country, which makes entry and egress easier. They swing back at the tap of a switch to provide easier access to the front of the cargo box. Silverado’s range also includes the distinctive Black Out Edition that’s offered on the WT trim. It features blacked-out trim and black-painted 20-inch aluminum wheels to give the truck a sinister appearance (interim availability). What hasn’t changed for 2016 is the quality customers can depend on. Silverado 1500 was the segment leader in the 2015 J.D. Power and Associates U.S. Initial Quality survey. Chevrolet Silverado is the most dependable, longest-lasting family of full-size pickups, with high-strength steel construction backed by proven V-8 power and efficiency. • High Country – offered exclusively on the crew cab – 2WD and 4WD. Regular cab models are offered with a 6’6” box or an 8’ box. Double cab models are available exclusively with the 6’6” box, while crew cabs are available with a 5’8” box or the 6’6” box. The entire lineup is available with a number of features engineered for serious towing, including the available NHT max trailering package, which features a 9.76-inch rear axle, heavy-duty rear springs, unique shock tuning, enhanced cooling and an integrated trailer brake controller to optimize capability and comfort when trailering. • Maximum trailering rating of 12,000 pounds (5,443 kg) – with the NHT max trailering package. Silverado High Country embodies rugged luxury – craftsmanship, authenticity and functionality – as Chevrolet’s premium full-size pickup. It is offered exclusively in the crew cab body, with the 5’8” or 6’6” cargo box, with 2WD or 4WD. It is distinguished by a unique chrome grille with horizontal chrome bars, LED projector headlamps and body-color front and rear bumpers. Unique 20-inch chrome wheels with P275/55R20 all-season tires are standard, as are chrome body side moldings, door handles and mirrors. Inside, it features an exclusive saddle brown interior, along with heated and vented, premium leather front bucket seats with High Country logos on the headrests, High Country-logo brushed metal sill plates, Chevrolet MyLink connectivity with an 8-inch-diagonal touch screen and navigation radio, Bose® premium audio, wireless phone charging, color-keyed carpeted floor mats and Front and Rear Park Assist. The available High Country Premium Package adds the Enhanced Driver Alert Package, which includes Forward Collision Alert, Lane Keep Assist, IntelliBeam and Safety Alert Seat. The package also includes a heated steering wheel, power-adjustable pedals and an integrated trailer brake controller. Silverado’s cabs are designed to reduce wind noise in the cabin. Inlaid doors, for example, fit into body sides rather than wrapping over the roof and combine with triple door seals to reduce wind noise and turbulence, helping quiet the cab. Also, the front of the truck is carefully sealed to provide efficient cooling with minimal aerodynamic drag. An aluminum hood with twin power domes also enhances efficiency with lower weight than a steel hood. When it comes to ergonomics, Silverado’s wide rear crew cab doors make it easier to get in and out of the truck, while the pickup box’s two-tier loading design, standard CornerStep rear bumper and ergonomically shaped handholds built into new box rail protectors make it easier to load and retrieve items. 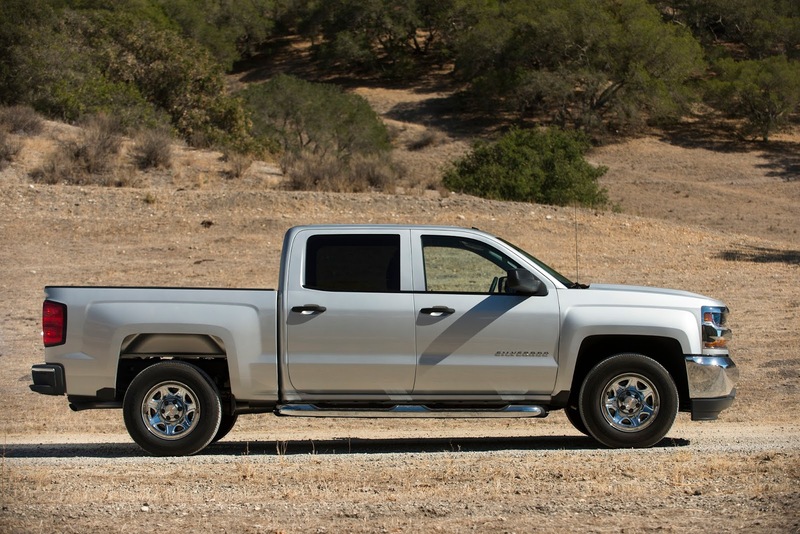 Silverado’s design also includes a smart pickup box that’s strong and durable – and offers greater cargo flexibility. It features a two-tier loading design that allows customers to insert a platform to separate items during hauling or conceal valuables below, such as power tools. The EZ Lift-and-Lower tailgate makes it easier to access the box. An internal torsion bar reduces the effort to raise and lower it, while a rotary damper allows for a controlled and more gradual lowering motion when opening it. The tailgate is also easily removable without tools. It is standard on LT, LTZ and High Country. Silverado also offers a remote-locking tailgate, which is available on WT and LS, and standard on all other models. To ensure loaded items remain in place while the vehicle is in motion, four integrated cargo tie-down provisions are built into the lower corners of the Silverado’s pickup box and adjustable upper tie-down hooks are available. The patented upper hooks – each rated at 250 pounds – can be placed in several locations around the upper bed rails, providing flexibility for securing loads of all shapes and sizes. Four of the hooks are included with the optional package, with additional hooks available as accessories from Chevrolet dealers. A box light is standard and mounted above the rear window, while available under-rail LED lights enhance illumination and turn on with the standard overhead box lamp. Heated, power-adjustable trailering mirrors are also offered on LS and LT, featuring segment-first LED rear guidance lamps. The Silverado’s interior is roomy, quiet and functional, with a strong cab structure the foundation for Silverado’s refinement. Nearly two-thirds of it is made of high-strength steel, while shear-style body mounts are used to tune out both up-and-down and side-to-side movement for a quiet, comfortable ride. Double and crew cab models have a set of hydraulic body mounts to further isolate the cabs. Active noise cancellation is standard when the vehicle is equipped with the available 6.2L V-8 engine. All models feature an upright instrument panel with a six-gauge instrument cluster and multiple storage options tailored to the needs of customers who rely on their truck for more than simply hauling cargo. The controls are logically placed and easy to operate with work gloves on. The instrument panel has a simple, intuitive six-gauge cluster. WT and LS models include a 3.5-inch driver information center display in the middle of the instrument cluster, with a 4.2-inch color driver information center display, for vehicle and infotainment data, standard on LT, LTZ, Z71 and High Country models. Ambient lighting highlights all functional areas, such as the “4x4” and headlamp switches, as well as the radio, for easier viewing at night. All models have extensive interior storage, tailored to the way customers use their trucks. An all-new center console – available on vehicles with front bucket seats – offers nearly one cubic foot (24.5 liters) of combined storage space – about 25-percent more room than a typical paper grocery bag, with the depth and width to conceal a laptop computer. The locking console accommodates hanging files for owners who use their truck as a rolling office, as well as controls for overhead ambient lighting, map pockets along the side, cup holders and reconfigurable compartments. It also includes USB ports, two 12-volt power points and a new 110-volt outlet. Plus, there’s a location on the console designed specifically for cell phone storage. The fold-down center armrest on WT and other models equipped with the 40/20/40-split bench seat offers covered storage and connectivity, with USB ports and two 12-volt power points. New wireless phone charging is available on LT and LTZ double cab and crew cab models with available bucket seats and is standard on High Country. • LT – 40/20/40-split bench seat in cloth with fold-down armrest that includes covered storage and three integrated cup holders, lockable under-seat storage compartment. Cloth bucket seats or a heated, leather-appointed 40/20/40 bench seat is available. • LTZ – Heated, leather-appointed bench seat with 10-way driver and outboard passenger seat adjusters, including power lumbar and driver’s two-position memory. Heated leather-appointed bucket seats are available. • High Country – Heated and vented, leather-appointed bucket seats with 12-way power adjustments, including four-way power lumbar control and two-position driver memory. High-wear material is used on the cloth seats. Along with greater durability, it is stain-resistant and can be easily cleaned. In fact, a spilled drink will bead on top of the fabric instead of soaking into it. Three interior trim colors are offered: Jet Black, Jet Black with Dark Ash accents and Cocoa with Dune accents. Silverado High Country’s leather-appointed seats come in an exclusive Saddle color. • Entertainment package – offered on LTZ and High Country, it includes a rear-seat DVD/Blu-Ray player, wireless remote control, a 9.2-inch-diagonal LCD display and two sets of wireless headphones. Upgrades and enhancements for 2016 include an all-new radio with a 7-inch-diagonal color touchscreen that’s available on the WT trim and standard with the LS. An 8-inch system is offered on higher trim levels and equipment packages. Both radios offer improved system speed and performance, faster, more accurate map loading, faster service reprogramming and redesigned navigation interfaces, including a quick list of recently browsed points of interest, point of interest country grouping, last destination screen and visual landmark indication with map guidance (on navigation radios only). The 8-inch radio offers enhanced voice command execution, while the new 7-inch radio uses pass-through voice recognition synced with the user’s phone. Also new for Silverado 7-inch and 8-inch radio systems is Android Auto and Apple CarPlay capability. Each provides simple and smart use of smartphones in the vehicle, integrating certain phone functions onto MyLink’s color touchscreen and allowing users to call up music, navigation apps and more via compatible phones. MyLink with the 7-inch display is compatible with Android Auto and Apple CarPlay. The 8-inch system features Apple CarPlay compatibility at the start of the model year. Android Auto capability is scheduled to be available on the 8-inch system later in the model year. Apple CarPlay takes the iPhone features customers want to access while driving and puts them on the vehicle’s display in a smart, simple manner. This allows drivers to make calls, send and receive messages and listen to music right from the touchscreen or by voice via Siri. Apple CarPlay-supported apps include Phone, Messages, Maps, Music and third-party audio apps. A full list of those apps can be found at Apple.com/ios/carplay. Apple CarPlay is compatible with iOS 7.1 or higher. Using either application is simple. A “Projection” icon on the MyLink screen is visible when a phone is not connected, then changes to indicate CarPlay or Android Auto when a compatible phone is connected via USB. Complementing MyLink to enhance Silverado’s connectivity is OnStar 4G LTE with a Wi-Fi hotspot. It provides a mobile hub for drivers and passengers to stay connected. The hotspot supports up to seven mobile devices and is on whenever the vehicle is on. It comes with a three-month/three-gigabyte data trial. It is available on WT and standard on other models. Five years of a subscription-free OnStar Basic Plan includes RemoteLink Key Fob Services, allowing owners to remotely start and lock/unlock a car (if properly equipped), and activate the horn and lights from anywhere with a data connection. It also includes OnStar Vehicle Diagnostics, which runs monthly checks of a vehicle’s engine, transmission, anti-lock brakes and more, and Dealer Maintenance Notification, which sends a diagnostic report directly to a preferred dealer to simplify service scheduling. • The 4.3L V-6 is SAE-certified at 285 horsepower (212 kW) and 305 lb-ft of torque (413 Nm) – the most torque of any standard V-6. • The 5.3L V-8 is SAE-certified at 355 horsepower (250 kW) and 383 lb-ft of torque (519 Nm). With EPA-estimated fuel economy of 23 mpg highway (2WD), it offers the best fuel economy of any V-8 pickup. • The 6.2L V-8 is the most powerful engine offered in any light-duty pickup truck, with SAE-certified 420 horsepower (313 kW) and 460 lb-ft of torque (623 Nm). It is available with LTZ and High Country, and matched with the 8L90 eight-speed transmission. At the heart of the EcoTec3 engine family is an advanced combustion system that maximizes the potential of the direct fuel injection system, cylinder deactivation, continuously variable valve timing and other technologies. The ability to more precisely control combustion also enables the engines to run with a higher compression ratio – 11.0:1 for the versions with regular fuel recommended. Higher compression is one of the best ways to simultaneously boost power and efficiency. In the U.S. and Canada, the Hydra-Matic 6L80 six-speed automatic transmission is matched with the 4.3L and 5.3L engines in WT, LS and LT models. Silverado LTZ and High Country models with the 5.3L and 6.2L engine are matched with the 8L90 eight-speed automatic. The GM-developed Hydra-Matic 8L90 is roughly the same size and weight as the 6L80 six-speed automatic. Its 7.0 overall gear ratio spread is wider than GM’s six-speed automatic transmissions. That provides a numerically higher first gear ratio, helping drivers start off more confidently with a heavy load or when trailering. The 8L90 also enables numerically lower rear axle ratios, which reduce engine rpm on the highway. The Silverado 1500 is engineered to deliver great capability with great refinement, with a quiet, controlled ride, great steering and braking feel – attributes that provide driving confidence when using the truck’s capability to its fullest. A fully boxed frame with the main rails and major cross members formed from high-strength steel provides a rigid base for maximum hauling capability, great noise and vibration isolation and excellent crashworthiness. The stiff chassis enables more precise tuning of the front and rear suspensions, for a more responsive feel with smoother performance and less vibration and shake, particularly on harsh terrain. • A high-capacity 9.76-inch axle is matched with 6.2L-equipped models and is part of the available Max Trailering Package, which is also available with the 5.3L engine. For owners whose work or recreation takes them off road, the Z71 Off Road package – on 2LT and 2LZ trims with 4WD – mixes aesthetic cues with greater capability, including 46mm monotube Rancho shocks, front tow hooks, Hill Descent Control, a transfer case shield and standard 18-inch wheels with all-terrain tires. Twenty-inch wheels and all-terrain tires are also available. • Hill Descent Control is engaged by the driver and uses the anti-lock braking system to enable a smooth and controlled descent in rough terrain. It is included with the Z71 suspension package. • Automatic locking rear differential reacts in milliseconds in low-traction situations to improve safety and confidence on wet, snowy or muddy surfaces. Without driver input of any kind, the rear axle engages when a wheel speed difference of 100 rpm or more is detected between the left and right wheels, providing instant traction for confident driving. During normal driving conditions, the differential functions as a conventional light-bias limited-slip axle. It is standard on Z71 and LTZ trims. It is included with the NHT Max Trailering Package and is available on other models. • Electric variable-assist power steering is standard on all models. It reduces steering effort at low speeds. Because there is no engine-driven pump, electric power steering also saves fuel and eliminates the maintenance associated with hydraulic power steering. • Four-wheel disc brakes. The large, vented front brake rotors measure 13 inches in diameter and are complemented by 13.6-inch rear rotors. • Duralife™ brake rotors offer up to double the service life. A GM-exclusive process protects against rust that, over time, can lead to steering wheel shudder. It involves super-heating the rotors to more than 1,000 degrees F (560 C) for an entire day in a special oven, where the nitrogen-rich atmosphere promotes nitrogen atoms to bond to the rotors’ surfaces, hardening and strengthening them. • StabiliTrak electronic stability control system is standard on all Silverado 1500 models, working in concert with the four-wheel-disc brake system and four-channel ABS to provide more precise and controlled ABS stops, greater traction and excellent cornering stability. It also incorporates rollover mitigation technology, which anticipates tip-up conditions – such as fishtailing – on a flat road surface and rapidly applies brake pressure to help reduce the likelihood of a rollover. • Trailer sway control is also standard and works with StabiliTrak to provide an added measure of confidence when towing a trailer. It senses conditions of trailer sway and, without input from the driver, intervenes with braking and/or reduced engine power to bring the trailer under control and keep it on its intended path. The system will use electric trailer brakes when a trailer is plugged into the standard wiring harness. • Integrated trailer brake controller and hill start assist are two more solutions that help owners do their work with greater confidence and less hassle. The trailer brake controller allows the driver to adjust the amount of output available to the electric trailer brake and to manually apply the brakes. With hill start assist, the brakes hold for about 1.5 seconds on grades of 5 percent or greater when the driver takes his or her foot off the brake pedal, preventing rollback for a more confident take-off on hilly terrain – especially with a trailer. The Max Trailering Package is available on 2WD and 4WD V-8 crew cab and double cab models and includes a 9.76-inch rear axle, heavy-duty rear springs, revised shock tuning for increased control, enhanced cooling and an integrated trailer brake controller. Also included is the G80 locking rear differential, a trailer hitch and bumper-mounted four- and seven-pin connectors. The 2016 Silverado’s safety systems incorporate technologies designed to protect the driver and passengers before, during and after a collision. The available Enhanced Driver Alert Package, offered on 1LT regular cab, double cab/crew LTZ and High Country, helps drivers avoid crashes with Lane Keep Assist, Forward Collision Alert, Front and Rear Park Assist, IntelliBeam headlamp control and the segment-exclusive Safety Alert Seat. Forward Collision Alert tracks the vehicle ahead using a forward-facing camera and a three-step visual and sound alert, while the safety alert seat, uses directional vibrations to warn of a crash threat. Lane Keep Assist technology provides subtle steering wheel input to help keep the truck within its lane when traveling at least 35 mph. • LATCH system helps customers properly install a child seat using a top tether anchor and two lower anchors located between the seat cushion and seatback. Additionally, StabiliTrak electronic stability control with rollover mitigation technology, trailer sway control and hill-start assist are standard. A rear-vision camera is available on WT, LS and LT, and it is standard on LTZ and High Country. The Silverado 1500 is part of a full-size truck family that underwent more than 6 million miles of durability testing in the torture chambers at the Milford Proving Ground, over the deserts and mountains of Nevada and across the frozen flats of Kapuskasing, Ontario. They also accumulated more than 7 million real-world miles development, bringing total test miles to more than 13 million. Silverado 1500 pickups are assembled in Fort. Wayne, Ind. ; Flint, Mich.; and Silao, Mexico.